Words by Fiona Symington-Mitchell. Photos courtesy of Vadasz Deli. He’s known as the Picklesman for his deli-style range of relishes, kimchis, pickles and sauerkrauts. We speak to Nick Vadasz about his pickles and ferments and ask him to explain all the fuss about lactic fermentation. Four years ago, he started Vadasz Deli. He was working as a street food trader selling hand-pressed corn quesadillas and found his pickles in demand from fellow traders and restaurants. So drawing upon his Hungarian heritage - “we had pickles at every meal” - he formally launched his range starting with some family inspired-recipes. 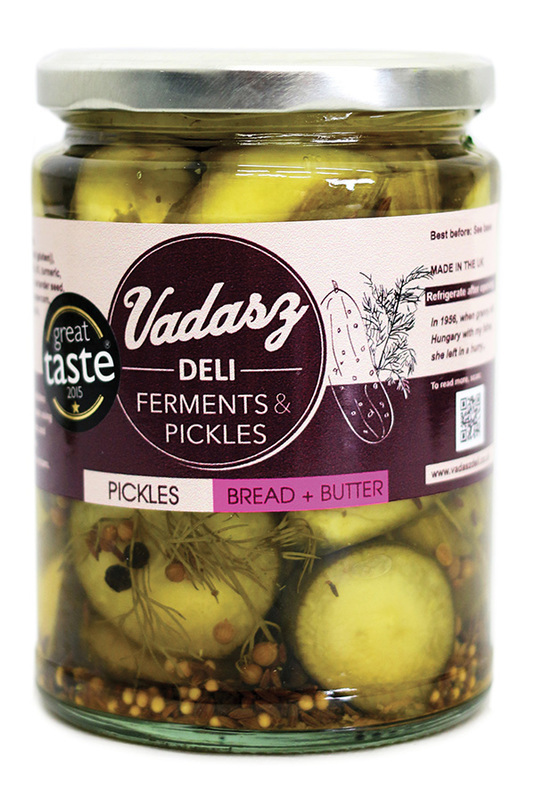 Today Vadasz Deli is a global range of relishes, kimchis, pickles and sauerkrauts, exceptional in their quality and flavour. Unlike commercial pickles, Nick creates his ferments and pickles using vinegar and lactic acid fermentation. The result is fresher, more dynamic condiments that surprisingly change in taste as they age. Pasteurised pickles (those that are heat treated) lack such vibrancy. While they can be made and stored for months, the style of pickles Nick makes rely on natural fermentation. This is why they taste better with all the associated health benefits. And his range only continues to grow. There’s now a Kimchi made from Chinese cabbage and sea salt, fermented with Korean red pepper, garlic, ginger, green onion and carrot. As well as the eye-watering Dog’s Green Relish inspired by Chicago hot dog relish, made with cucumbers, kraut, onions, caraway and dill, and the 2015 Great Taste Award, Bread and Butter Pickles. 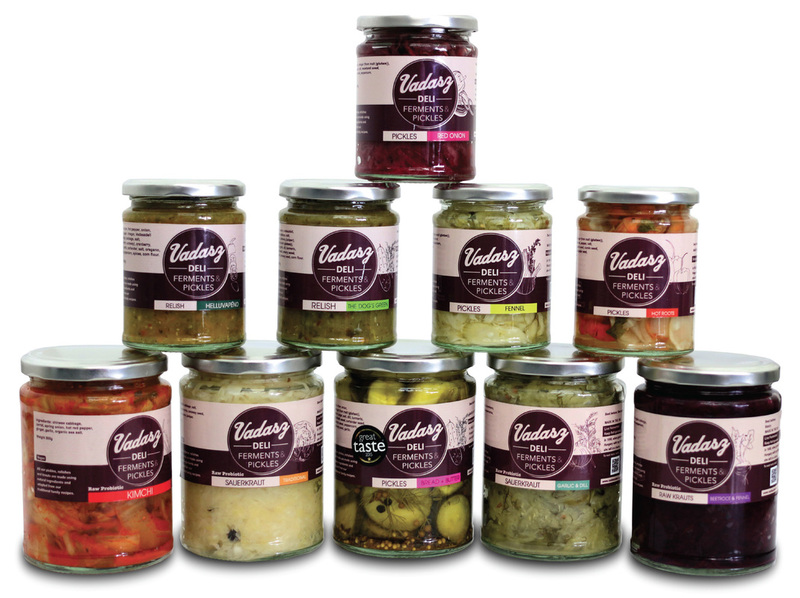 To stock your larder, you can find Vadasz Deli at Brockley Market on Saturdays and Ally Pally on Sundays. Nick regularly supplies to restaurants; so you could easily find yourself enjoying his pickles at your favourite American burger joint or Leon, where they use his Dog’s Green Relish. You can find a full list of his products and where you can find them here. What impresses me most is the sheer quality of the food from our restaurants to what is being made by artisan producers. We are spoilt for choice whether that be bread, coffee, cheese, charcuterie and even pickles. I am in awe of people like Hugo Jeffreys from Autumn Yards Meat - some of the charcuterie that he creates is just fantastic. I’d say Cobble Lane Cured as well. They’re unbelievable those guys and we supply some of the same places. Phil and Keith at Wildes Cheese. I just love their cheese, and Blackwoods Cheese Company. They are all real, very talented people doing some amazing things. Those are my heroes. High Street North, East Ham: it’s not a place that’s on the radar but go there for the Sri Lankan but mainly south Indian food. There are some vegetarian restaurants down there that do the most amazing dosas and thalis. They are unbelievably cheap. Sandor Katz’s book The Art of Fermentation: An In-Depth Exploration of Essential Concepts and Processes from around the World is a fantastic reference book for anyone who wants to start fermenting at home.